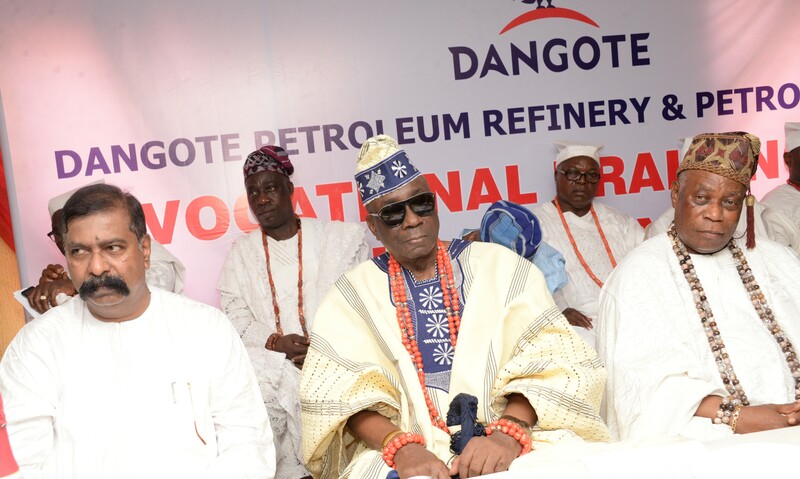 The Oba of Lagos, Rilwan Akinolu, has commended Dangote Group on its youths empowerment programme within the host communities which commenced six-month vocational training for youths of Ibeju-Lekki on human capital development in various marketable skills. Akiolu said this at the official flag-off of the capacity building programme for 200 youths in Ibeju Lekki area of Lagos State on Wednesday March 20. He said Dangote Group was one of the few indigenous companies that had impacted their host communities even before commencement of operations. He prayed for the successful completion of Dangote Refinery so that Lagosians as a whole can be beneficiaries. Akinolu urged the youth to put in their best in the programme by concentrating on what they were learning. He also urged the leaders of the communities to encourage the people to support Dangote’s programme. Dangote Industries Ltd., commenced six-month vocational training for youths of Ibeju-Lekki on human capital development in various marketable skills. The Group Executive Director, Dangote Industries Ltd., Mr. Devakumar Edwin said the project was designed to equip young men and women with trade skills. The programme was organised by Dangote Petroleum Refinery & Petrochemicals and facilitated by the National Directorate of Employment (NDE) and the Nigerian Content Development and Monitoring Board (NCDMB). According to Edwin, the company’s focus on Corporate Social Responsibility (CSR) projects are centered on the development and wellbeing of the people, especially its host communities. The Dangote helmsman said that the 650,000 barrels-per-day refinery would become the world’s largest single train refinery on completion. Edwin said the trainees will be given allowance during the course of their within six-month, while those who excel would be employed. The Executive Secretary of NCDMB, Mr. Simbi Wabote who was represented by Mr. Frank lbi, Manager, Gas and Refinery, NCDMB, commended Dangote for the landmark initiative towards empowering youths of their host community. Wabote assured that the board would also support in the human capital development, affirming that the board would ensure that the youth would be engaged after completion of their training. He urged the trainees to be more dedicated, focused and committed to the programme. “We are confident that you will do well and be employable with the involvement of the NDE. We commend Dangote for the gigantic project in the community; this is a litmus test for bringing local content development to the youth of this community". One of the trainee, Mr. Yesiru Sanni, a mechanic commended Dangote for the opportunity given to the younger generation in Ibeju-Lekki community, urging Dangote to assist the community with library and school to encourage the youths. Present at the flag-off ceremony were representative of the Lagos State Government, Council of Obas, Representative of Vice-Chancellor of University Lagos, the Chairman of Lekki LCDA, Mr. Olaitan Ogidan among others.